ABOUT 40 years ago, Israel was widely recognized as "an island of democracy, tolerance and freedom in a sea of hate-filled dictatorships," according to Jeff Jacoby, a columnist for The Boston Globe. "It was just common knowledge," Jacoby told more than 100 people Aug. 19 at The Temple-Tifereth Israel in Beachwood. "Everyone understood what the reality was in the Middle East." Somehow, the perception of Israel has changed over the years. 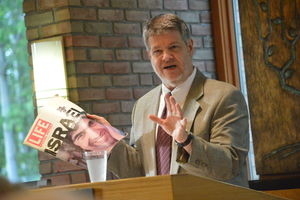 Jeff Jacoby, a columnist for The Boston Globe, discusses Life magazine's special report on Israel from 1973 during his talk Aug. 19 at The Temple-Tifereth Israel in Beachwood. "(Today) more than at any point that I can remember in my lifetime, hatred of the Jewish state is taken as reasonable, natural, understandable," he said. Jacoby, who grew up in University Heights, offered his analysis of what has gone wrong in his talk, "Whatever Happened to Israel's Good Name?" Israel Bonds and The Temple co-sponsored the program. "I want to argue that what has so badly corroded support for Israel is nothing less than Israel's support for the so-called peace process," he said. "That's what is happening to Israel's good name, that's what has made Arabs and Palestinians so much more intransigent, and that's the reason Israel is demonized more vehemently now than it ever was before." Jacoby, 56, displayed a special edition of Life magazine from 1973 that featured Israel on the 25th anniversary of its becoming an independent state. "Just look at the cover," he said. "This whole magazine is devoted to Israel, and it's clearly laudatory, praiseworthy and admiring. It celebrates what Israel had done ... This is the way Americans, or the American media and public sentiment generally, used to see Israel. So what happened?" Jacoby believes the turning point was Sept. 13, 1993, when former Israeli Prime Minister Yitzhak Rabin and Yasser Arafat, former chairman of the Palestine Liberation Organization, signed the Oslo Accord on the lawn of the White House with then-President Bill Clinton looking on. "The whole world, it seemed, was welcoming this idea that Yasser Arafat, the face of modern terrorism, had become a peacemaker," he said. "The euphoria was unbelievable. "You remember what happened. The Palestine Liberation Organization came to be called the Palestinian Authority, and it was given money and weapons and broadcast rights – all the trappings of statehood except for formal recognition as a state. This was going to bring about, once and for all, a two-state solution, and the conflict at long last would be over." Of course, that didn't happen, and Jacoby offered three reasons why the "peace process" that began in 1993 "has changed everything." "No. 1, the so-called peace process undermined Israel's claim to the Jewish homeland ... with (saying) that Palestinians have a right to the land," he said. "The peace process reinforces the notion that Jews have no business on any land that Arabs claim for themselves." The second reason, Jacoby said, is "a step-by-step retreat by Israel from its red lines" over the past 22 years. "Israel has backed away from one position after another that used to command overwhelming support," he said. "The message received on the other side was if you hit the Israelis hard enough, if you increase the pressure severely enough, they'll back down on anything." Thirdly, the peace process "has conditioned the world to believe that the absence of peace is Israel's fault," Jacoby said. "Most Israelis know there's no significant Palestinian support for a two-state solution," he said. "There's no peace partner. And as much as Israel and Israel's friends want peace, you can't make peace if you don't have someone who wants to make peace with you. "I argue that after 22 years, Israel should give up on this woefully misnamed peace process, which has so badly hurt Israel's image without bringing peace even one inch closer. Peace is a great Jewish value. But it isn't essential. Israel can survive without peace, it can thrive without peace, and the proof is that it has done so for 67 years." Jacoby, a graduate of Hebrew Academy of Cleveland who lives in Brookline, Mass., has been an op-ed columnist for The Boston Globe since 1994. His parents, Mark and Arlene Jacoby, of University Heights and Israel, attended the talk.